This week Simon Says: Anything Goes! The design team is featuring Wild Rose Studio products, it isn't a requirement to use them but if you have them we would love to see them! 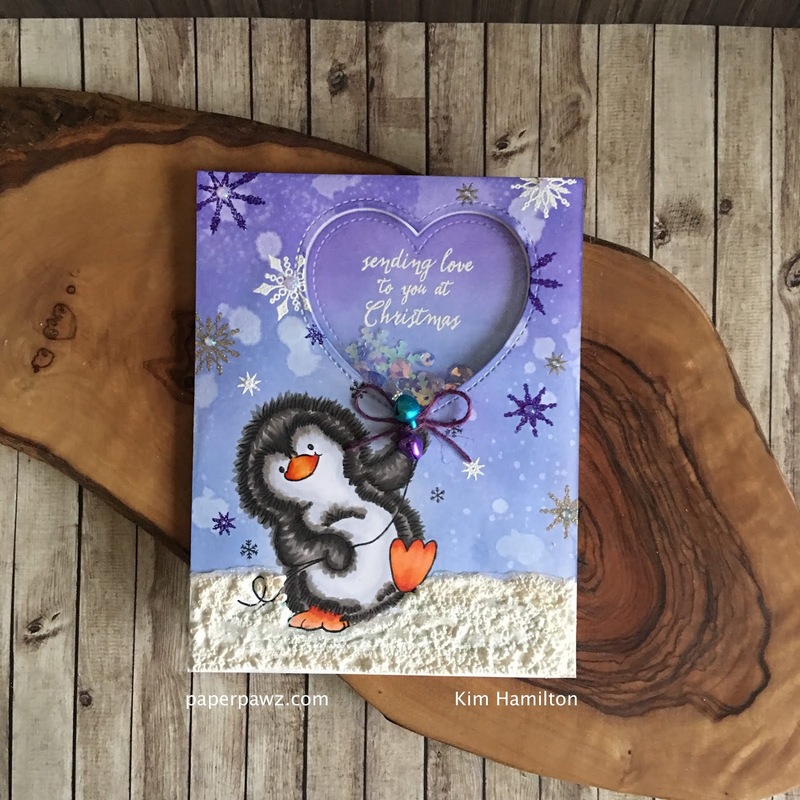 I chose the sweet Penguin with Heart stamp set by Wild Rose for my card today. I just love the illustration of their stamps and this guy is no exception! 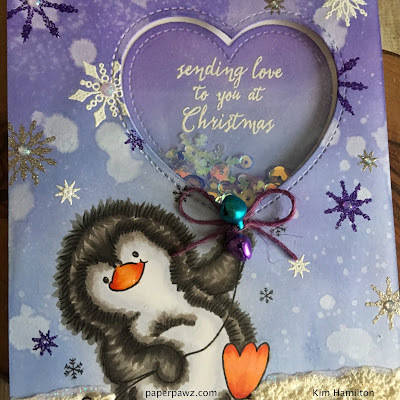 The stamp itself has a heart balloon but I really wanted to use the Pretty Pink Posh Winter Sparkle shaker mix and it ended up being my color inspiration for this card. A mix of iridescent sequins in blues and purples with some snowflakes, it really is a beautiful mix. So I picked a Lawn Fawn outside in Stitched Heart die for my shaker window that acted as the balloon. 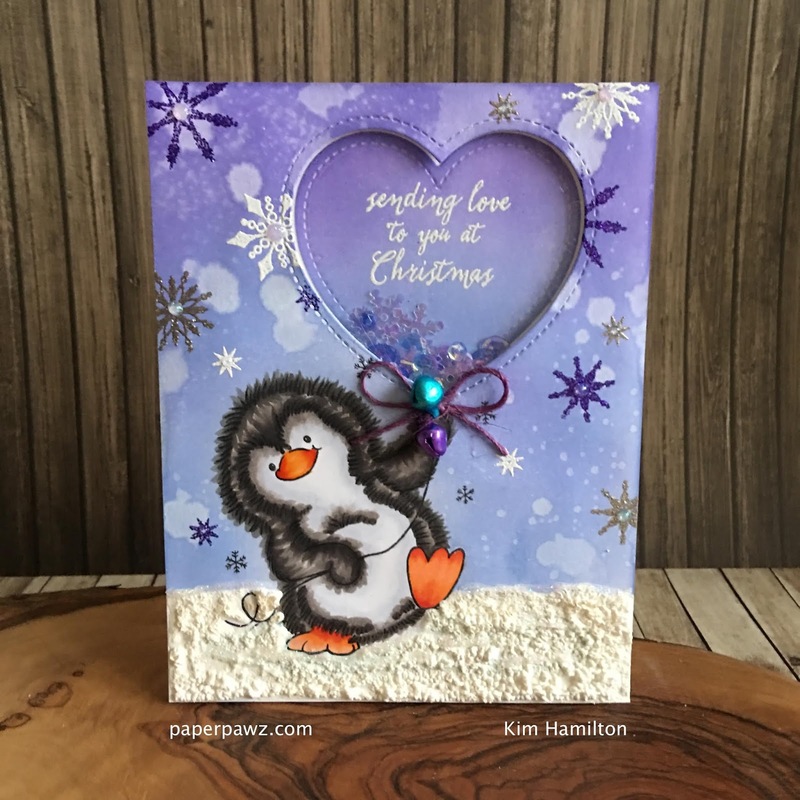 I stamped my penguin on a piece of Neena 80lbs card panel using my Misti and re-stamped on masking paper so that I could do my background ink blending. After he was masked, I added a piece of PostIt tape to the bottom and blended some Wilted Violet and Shaded Lilac Distress inks with a light hand. The colors were chosen based on the sequin mix but I do love non-traditional colors for the holidays. I added some water with my distress sprayer for the droplets. While that dried I die cut the insert heart and used the same ink colors. I went back and coloured in my penguin once that was done, I die cut the heart "balloon". 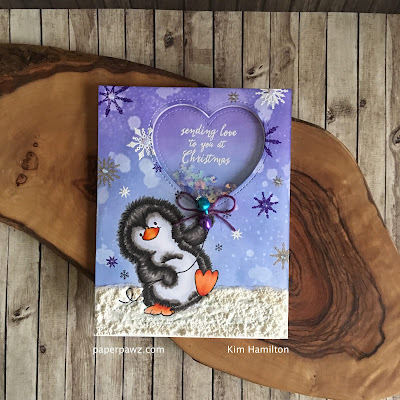 I added a few embossed snowflakes around the background and added some White Blizzard Nuvo Glitter drops to the centres. Once that was all dry, I addd my snow marker to the bottom and dried it to "puff" it up with my heat tool and embossed my sentiment on the heart. I added my sequins to the centre of the heart and put the top panel on the base using 3m Foam tape so the sequins could shake. To finish off the card, I added bells and twine from my stash to the ballon base. This penguin is DARLING and I love the purple background with the heart balloon shaker and the fab snow! !